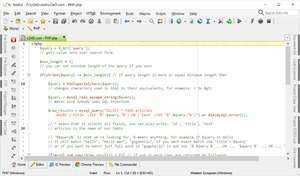 RJ TextEd is a complete programming and text-based editor with support for Unicode, with which you work on your HTML files, PHP or any other text-based format very comfortably. RJ TextEd includes several features to facilitate your daily work, such as auto-code labels or the use of a colourful syntax-highlighting depending upon the language you're programming in. With this excellent text editing application, you also have access to a code validator, a spell checker and a number of predefined templates. RJ TextEd also has a CSS editor and an FTP client. Version 13.81 is a freeware program which does not have restrictions and it's free so it doesn't cost anything. For security reasons, you should also check out the RJ TextEd download at LO4D.com which includes virus and malware tests. Additional screenshots of this application download may be available, too.